Breath a sigh of relief, Nintendo fans: the Wii U is speeding up! Most would agree that the Wii U loading screens haven’t been the most convenient for gamers. However, Nintendo is doing major work to improve on their system and remedy the situation. An upcoming Wii U system update will help to fix problem and speed up the load times between menus and returning to the home screen. Hello, this is Satoru Iwata of Nintendo. As we announced in the January Nintendo Direct, we plan to release two Wii U system updates. One in spring, and one in the summer. Today, I would like to let you know the status of these two updates. We are planning to release the spring system update in April, which will improve the time it takes to launch software, and the time it takes to return to the Wii U Menu. We still have tests remaining, and it will take a little more time until we can release the update. 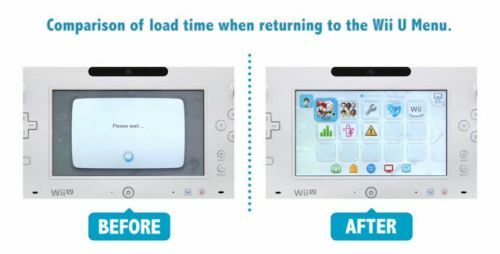 But today, we have prepared a video so you can see how the loading time will change when returning to the Wii U Menu with the system update, so please take a look if you are interested. In the future, we would like to share announcements about Nintendo Direct events here, so we appreciate your continued attention. And lastly, like in other Announcement Communities, please understand that while we read every comment, we are not able to reply. Thank you.